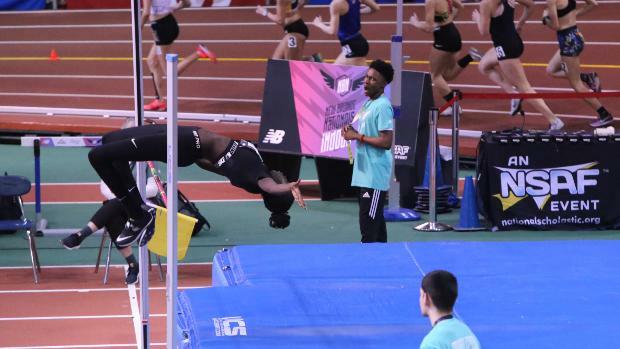 Westbrook's Nyagoa Bayak once again earned All-American honors in the high jump as the LSU bound senior finished as the national runner-up clearing 5-10 3/4 with no misses. Bayak improved on her third place finish from a year ago, and matched her outdoor finish from last spring. The high jump was won by Morgan Smalls of North Caorlina who cleared a junior class record of 6-3 1/4. The three time New England champion opened at 5-7 for the first time clearing the bar with ease, her next bar was 1.75m or 5-9 1/4, and once again she cleared on her first attempt. The next bar was 1.80m or 5-10 3/4. Smalls cleared first then Bayak followed with another easy clearance. They were joined by two others as the bar raised to 1.85m or 6-0 1/2 - Smalls cleared on her first to stay clean while Bayak missed for the first time. Smalls was the only one to clear as Bayak missed both of her remaining jumps. Bayak competed in the emerging elite triple jump early in the day, qualifying for the final with a seasonal best 38-4 3/4 on her final attempt of the trials. She would take just one attempt in the final before passing her final two to prepare for the high jump. Cheverus sophomore Victoria Bossong running in section seven of the emerging elite 400m at New Balance Indoor Nationals won the event in a new state record of 55.28 to lower her own record from 55.66 run at the BU Last chance meet two weeks ago. 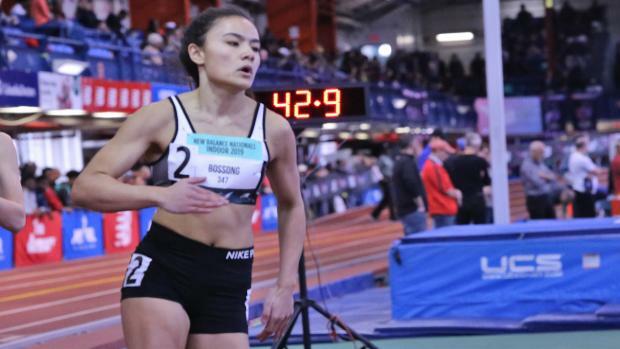 Bossong came through the first 200m in 6th place in a time of 26.20, but that didn't deter the Class A state champion from shifting gears and finding another one in the final thirty meters as she snuck by Michaela Rose to win by .13 of a seconds. Her 29.07 last 200m was enough to cross the finish first. Bossong return to the track shortly after her record breaking run and clocked a personal best 25.12 in the emerging elite 200m. She finished 19th overall out of a field of 46th. Class A state champion Mahamed Sharif ran in section three of the emerging elite 800m. Sharif who ran 1:54.89 to qualify for the event winning the Dartmouth Relays was running on a banked track only for the second time in his career and the first time at the 800m distance. He opened with a speedy 27.17 for the 200m positioning himself well in second place. 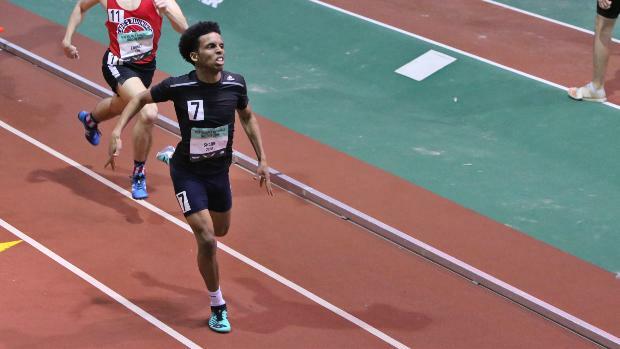 He remained in contention through the 400m in 55.38, and 600m in 1:24.66. It was anyone's race with 100m to go and Sharif went hard finish second in the section in a new state record 1:53.72, the winner came from section 2. The mark erased the 1:54.16 set back in 2010 by Greely's Mark McCauley. 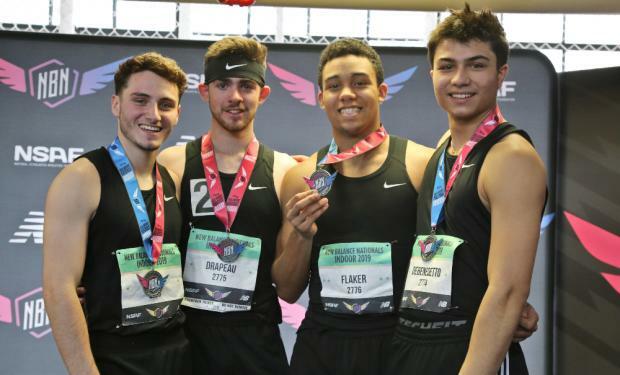 The Scarborough boys sprint medley team of Ben Hatch, Salvator DeBenedetto, Jarett Flaker & Noah Drapeau finished fourth overall in emerging elite race. Hatch led off passing to DeBenedetto as the Red Storm were third entering the 400m leg. Flaker moved them up with a 49.59 split to second. Drapeau was chasing the leader, and got some help as Rahway, NJ joined the fray with one lap to go. Rahway's anchor & Drapeau got by the leader and battled to line where just .01 separated them. Scarborough would be second in the heat in a new state best of 3:36.94 lowering the previous mark of 3:40.32 run by the Red Storm in 2010. 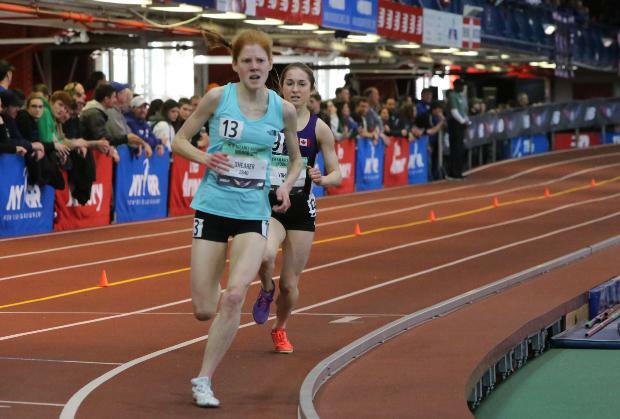 Helen Shearer of Hampden Academy placed 6th in the emerging elite 2 mile as she won section 1 in a new personal best 10:52.30. The time lowered her previous best by almost eight seconds run just last week at the New England Championship. She went through the mile in 5:26.02 before finding an extra gear over the last 200m to go past the leader and close the last lap in 37.73. Shearer's effort moves her to fourth on the all-time list in the event. Gorham's Kate Tugman ran in section three and ran 11:00.84 good for 16th overall, her time was just off her previous best at the New England Championship of 10:55.54. Emma White of Cheverus placed 11th in the emerging elite jumping 37-4 on her first attempt. Anthony Clavette of Scarborough finished 14th in the emerging elite high jump clearing 6-3 1/4 on his second attempt. Portland's Jaidyn Appel cleared 5-3 to finish 19th in the merging elite high jump while Evelyn Kitchen of Gorham cleared 4-11 to finish 38th.